Curing bacon is one of those things I've always wanted to try but never got round to. 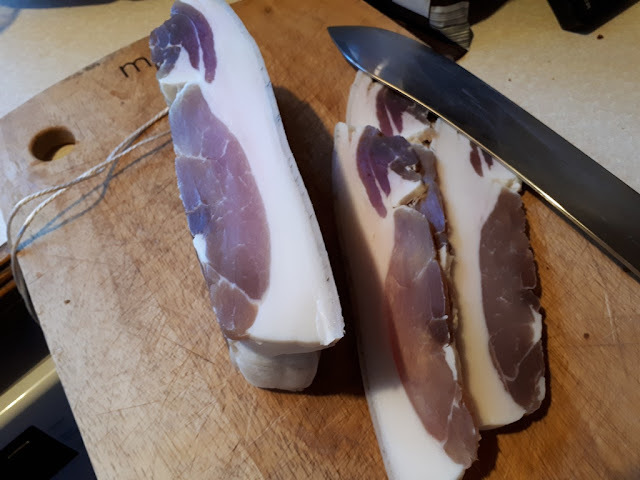 After the pig butchery weekend I decided it was time to take some of that lovely Berkshire pig to the next level and make bacon! 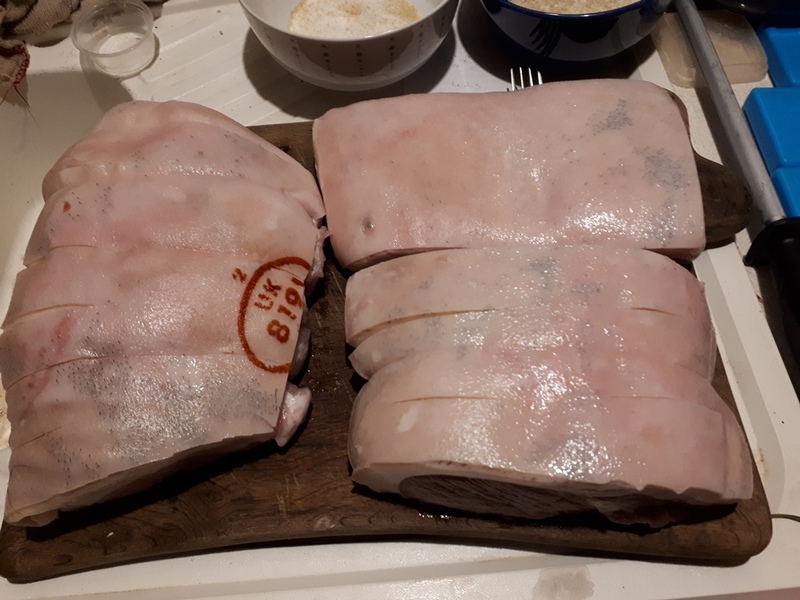 I chose three joints that I thought would make nice streaky and back bacon. 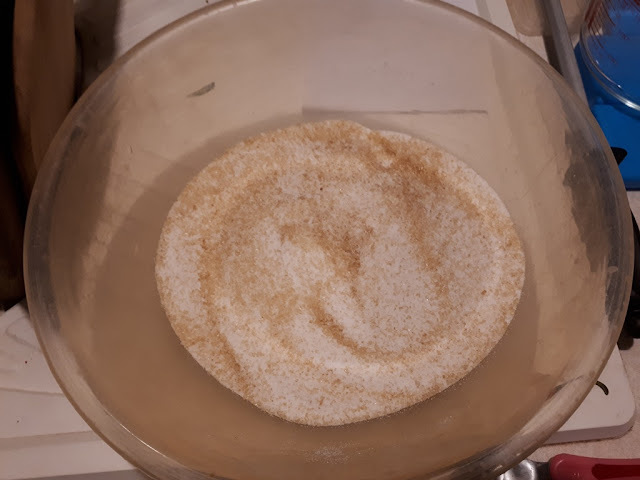 I made things a little harder for myself by making my own cure, I brought the salt, saltpeter and brown sugar to do the mix. 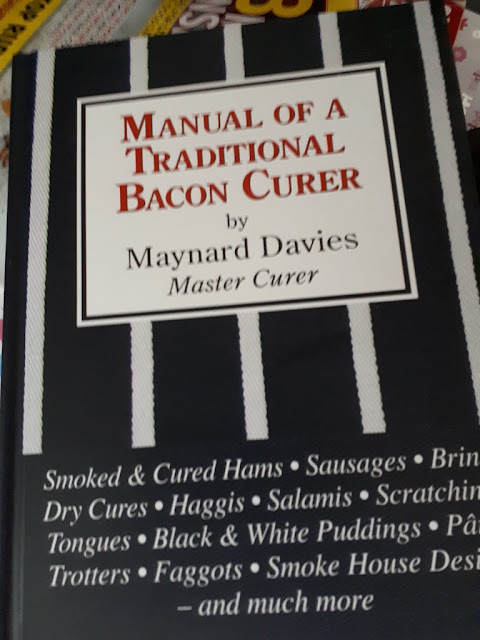 Unfortunately the book I have only has imperial measurements in and my brain wasn't working well that night so I was really struggling to work out how much cure I needed per lb of meat! I got there in the end but metric or cup measures are so much easier! Funny because I'll quite happily use feet and inches for measurements. 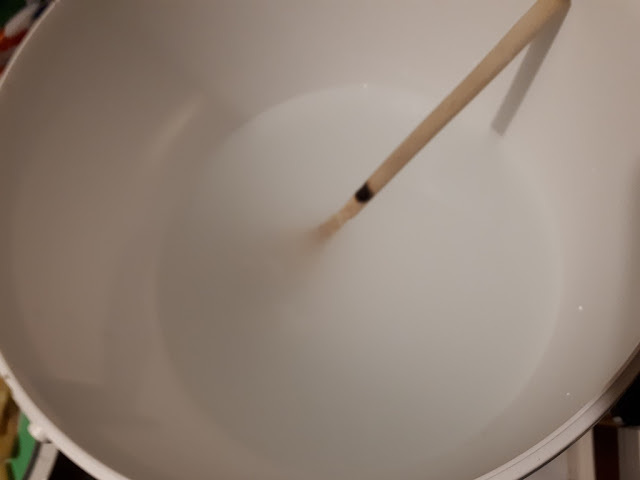 I made a salt brine to start with to clean the meat. The Joints only floating in this for ten minutes then dried off on some chopping boards. I then got the salt cure ready and weighed out enough for each joint. The joints with the cure rubbed all over then get placed in a freezer bag in the fridge. I think it could have happily gone just in the shed to be honest as it was plenty cool enough when I did it. After five days these came out, got washed off and then got hung in the shed for a couple of weeks to let the cure penetrate further in. I tried them with some trepidation. I'd always heard that home cured bacon was far too salty and horrible. Not this though! This was lovely, it certainly had a more meaty taste than we've had for a while and there is a fair amount of fat on it as well (as you can see in the picture!) but it fried up a treat! So far we've eaten one and a half of the bacon joints. 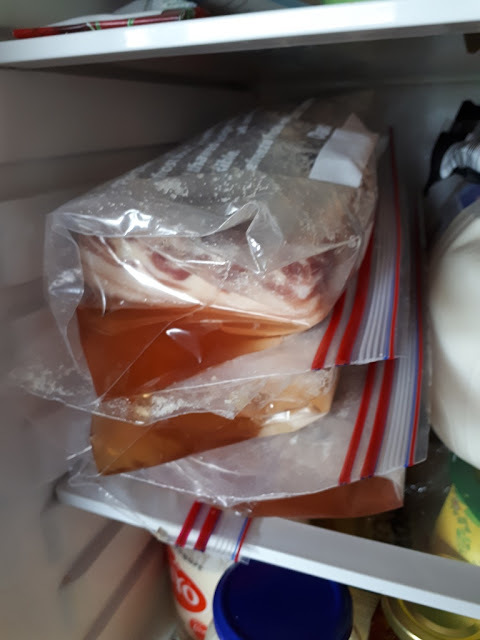 They've only been in the fridge for five days, whilst in the bags curing, and the rest of the time just hanging there with no refrigeration, well over a month old now from when they were butchered out of the pig. We're so dependant on our fridges and freezers I find it amazing to have meat out like this and it still be completely edible after this time. No dates on this meat, just my senses to tell me if it's okay or not. Anyone else cure their own meat? Have any recipes you think I should try? 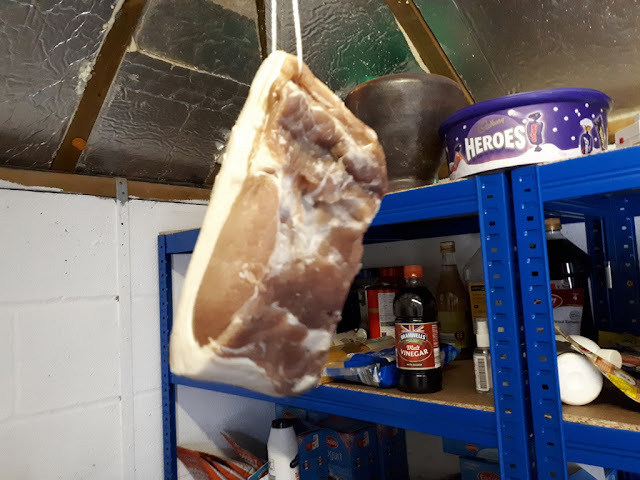 It looks good nothing beats home cure bacon, I am looking to try curing some goat meat. I think that would be a amazing, it's funny how we think of it as just something to do with pork or beef these days. In the past they would have tried to preserve everything. My granddad raised a couple pigs every year, but he made sausage, not hams and bacon. Naturally, you can put the sausage up by canning, if you lack refrigeration, or don't trust the grid. Also by doing that he could have skinned the animals rather than scalding them which would have been much easier. I always weigh in imperial, old habits die hard. But dressmaking and measuring always in metric, strange how we are wired. Some cakes I cook in old measurements but this was so many oz for every lb of meat but the number of oz's just doesn't work in my head for some reason! Your next step is smoking the cured meat. I do not have the 'front end' of the process available. I do not have raw pork to start with. So, I buy the nicest thickest sliced bacon I can find, then put it in my smoker to 'resmoke' it. It comes out wonderfully! 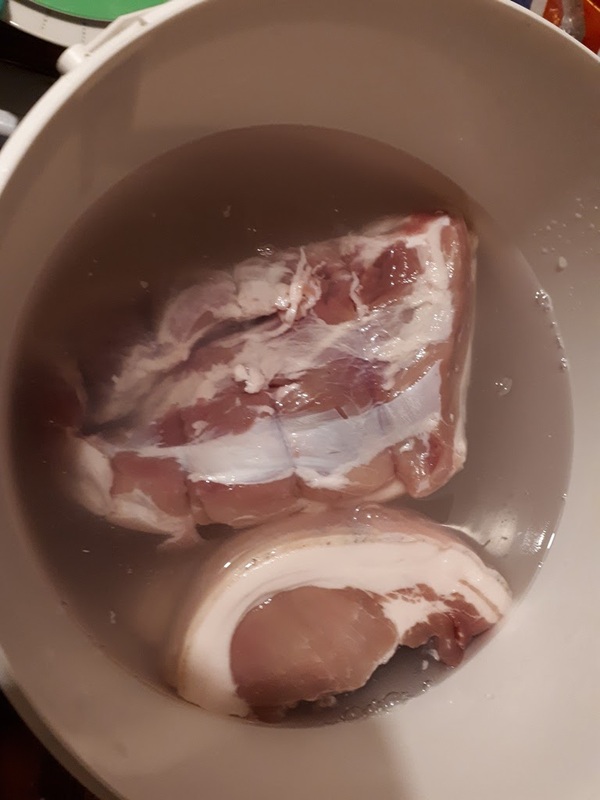 So, my advice is to give your bacon a try with home smoking. Yes, a smoker would be a great addition to what we have here. I'd love to build one but once the house is finished. I'd love to smoke some cheeses as well! This looks amazing. Good work! I've tried venison prosciutto twice but my issue is finding a place cool enough to hang the meat long term without it getting discovered by mice. It was so disgusting and sad when that happened. This time of year the shed never goes above 10 degrees so it's not too bad for doing this type of thing. I want to get an air con unit in there at some point so I can do some stuff in the summer as well. The shed was built out of block to stop the mice as well, that would be heart breaking. I dry-cure mine. 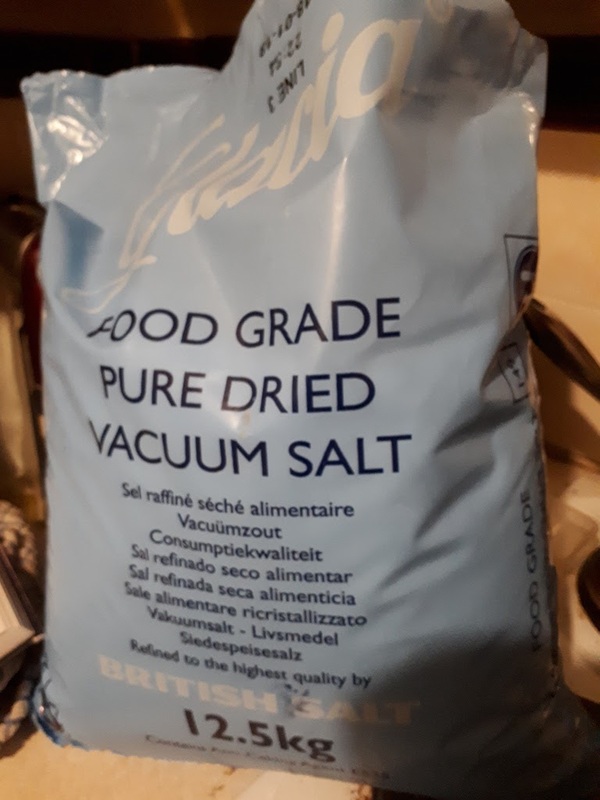 About 4 days in the salt/sugar, then air dried for about a week. My very first attempt was a bit too salty, but I soon fixed that. The only problem with my method is that the rind becomes very hard, and has to be removed before slicing. Yeah, the stuff I buy from the butchers has a hard rind like that. I'm going to experiment next winter though and try different cures and methods. I'd love to do a big wet cured ham as well. Haven't yet. Hopefully this year I get to try it. I'll smoke mine after its cured. Too scared to let it air dry. I would be afraid the temp fluctuations would ruin it and I don't really have a place that has constant room temperature where it would be safe. A smoker is high on my list of things to buld, I'd love one here and as I'm a carpenter there's never any shortage of woodchip to do the smoking with!